Delicious: Emily's New Beginning is a newly released time management game that challanges you in three things: running a restaurant, taking care of a baby, and doing the two things simultaneously! That is no easy job to do, that's for sure. You are going to have quite a lot of customers coming and making their orders and you have to be fast enough to assemble and serve or sell those. It adds a little bit of charm if you are familiar with the series and know who Emily is, but even if you don't, you'll be glad to meet her. Now that she's with a baby, she decides to get back to work. 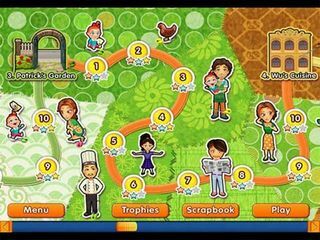 Running a restaurant is no easy job on itself, but your challenge is doubled now because of the little one! There are three levels of difficulty through for you to choose how much you can handle. The game's very bright and colorful with a happy melody to go with it. You are going to have quite a lot of customers coming and making their orders and you have to be fast enough to assemble and serve or sell those. Nothing new there. You are going to try and get as much resources as possible to attract more customers. So remodelling and upgrade is an important part for the business. The baby is going to be right there with you. Once in while you will have to go to her and take care of her. 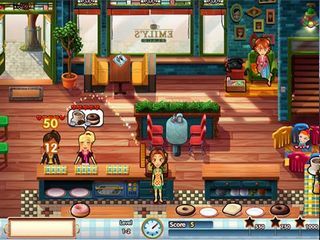 Delicious: Emily's New Beginning is a fun and charming time management game with an engaging story. This is Delicious: Emily's New Beginning review. Download this game here.